NEW YORK • It should have been one of the happiest times of Tseng Yu-te's life. 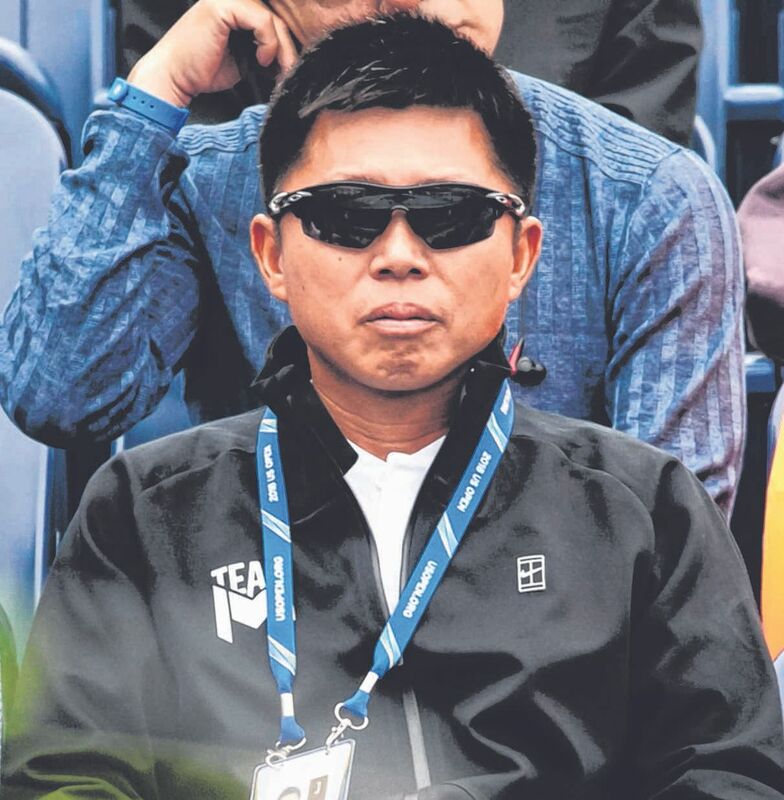 But Tseng, the father of the world's best male junior tennis player, lowered his head and put his right hand to his eyes, trying to stem the flow of tears. He was sitting in a garden at the US Open in September after his son, Chun-hsin, had won another big match. But while a friend patted him on the back, Tseng needed more than a minute to compose himself and explain his sadness. For years, Tseng has coached his son, who plans to turn professional at a tournament in Hong Kong at the end of the month. For years, father and son have travelled the globe while 17-year-old Chun-hsin, also known as Jason, soared from a working class background in Taipei to the top of the junior tennis rankings. He tore through the competition this year, reaching the final of the Australian Open junior singles tournament in January and winning the French Open junior title in June and Wimbledon's in July. He was also a semi-finalist in the US Open boys' event, and finished the year as the No. 1 junior. But while he was achieving all that with his father by his side, Jason's mother remained in Taipei, running the family's small food stand and looking after his 15-year-old brother, Tseng Yun-di. For his mother, Tsai Chung Han, the heavy workload has taken a toll. My wife has developed health problems from working so hard (running the stall). With us travelling and her staying at home, she is starting to feel that the body cannot hold up. I don't want her to go through this. TSENG YU-TE, father of top junior Chun-hsin, on the sacrifices his wife has made for their son's tennis career. The family owns a stall at the Lehua night market in Taipei, where they sell tanghulu, a treat made of haw and tomatoes on a stick. They stay on their feet from 4pm until 1am, with hardly a moment to spare for a break. When Tseng cannot be there because of Jason's travel schedule, his wife is left to do it alone. But she suffers from myotenositis, a severe inflammation of her limbs, likely caused by repetitive stress from doing the job since they opened the stand in 1999. "My wife this year has developed health problems from working so hard," Tseng said through an interpreter after his tears subsided. "Of course, when Jason gets very successful, we won't have to worry about the financial situation so much." Jason's parents have tried to shield him from the burden of feeling like the family bread winner, and during an interview in September he said: "I never think about that." But they all know the stakes. As he enters the professional ranks, Tseng is ranked No. 441. Studies have shown that only the top 100 players or so earn enough money to make a living, after subtracting travel and coaching expenses. For now, financial support from Formosa Plastics Group, China Airlines and Taiwan's tennis federation help Jason pay for his training and travel. He is the first boy to win two Grand Slam junior singles titles in the same year since Filip Peliwo of Canada did it in 2012. That does not always translate into success on the professional tour, though. Peliwo is currently ranked 259th, and his best career ranking was No. 161, in May. In the five years since he turned pro, the 24-year-old has earned US$274,386 (S$377,200), or about US$54,000 a year. Some players who won one or more Grand Slam junior tournaments became superstars, like John McEnroe, Roger Federer, Stefan Edberg and Andy Roddick. Others, like Uladzimir Ignatik, Yuki Bhambri and Peliwo, have not fared so well. Jason certainly has the shots, tenacity and baseline power to make a living on tour. But at 1.72m and 61.7kg, he will be challenged to reach the elite level in a sport that seems to be trending in favour of tall players with huge serves. "He's tiny for the moment," said Patrick Mouratoglou, coach and head of the Mouratoglou Tennis Academy in France, where Jason has trained since he was 13. "But he's going to be strong because he's an incredibly hard worker." Jason, who began playing tennis at the age of five, noted: "I don't have a lot of time to go out with friends and do relaxing things. I was always working, working. That is how the professional player has to do it." The Tsengs plan to shutter their business next year because of Tsai's deteriorating condition. But now that Jason will be earning some money on tour, the investment in his future may pay off and the financial burden eased. "I don't know how far he can go," Tseng Sr said. "But we are doing everything we can to maximise his talent."